Filled with enthusiasm for my subject, this issue is following closely on Cantab 86. So please read it now, before being overcome by seasonal preparations. Good wishes for Christmas & 2017. Last month’s article on some old pits and quarries produced a prompt and enthusiastic response. Clearly, readers share my enthusiasm for old pits festooned with rampaging wild flowers and bushes, or sheets of water enlivened with wheeling flocks of birds. Several people noted other pits which I had not mentioned, this being a matter of space. I could have included Coploe Hill old chalk pit maintained as a nature reserve off Coploe Rd (TL 493 426) above Ickleton, or a former chalk pit in Haslingfield, accessed by a short lane at TL 409 519, both noted for their wild flowers. In Anglesey Abbey grounds, the fish pond not far from the Mill, is described as an old quarry! However, this issue I intend to move on to examples of another type of interesting ground features, moats. I emphasize the word, “examples”. A leaflet produced by the County Archaeology Dept, ca 1990, suggests there are 340 moats recorded in Cambridgeshire, moats being one of the commonest kinds of medieval remains in today’s landscape. The ones I have selected are primarily in South and East Cambridgeshire, and are visible to the walker, at least from a public footpath or a road. Most have some provenance. Elsewhere in Swaffham Bulbeck, in the period 1250 – 1350, there were also double moated enclosures, encircling manors at Burgh Hall, Lordship Farm, and Downing College Farm. In the short walk described below, on the footpath in front of Lordship Farm, note the curved linear depressions in front of the old farmhouse. Leave Denny Moats, and walk across the green, towards Lordship Farm. A kissing gate gives access to a short path leading to Commercial End. Walk down this road towards the old Abbey. Between newer homes, are the old buildings reminding us of the prosperous waterborne trade in the period 1600 to the beginning of WWI. The old warehouses are now impressive residences. At a T-junction, TL 558 633, turn left along the tarmac lane towards Cow Bridge, and either continue on White Droveway, to join the main road back to Swaffham Bulbeck at TL 551 628, or use the footpath starting just beyond Cow Bridge. (2 miles).The walk can be linked to excursions from Anglesey Abbey, or with walks from Swaffham Prior. The “Shell” guide says the plastered and many-gabled Morden Hall is one of the best preserved moated sites in the county. The house, off Trap Road, TL 280 437 was built after some destruction in the Peasants Revolt in 1381, and is set within an imposing and attractive moat still 10m wide, and waterfilled. Parking for a few cars can be found outside the rec fence, opposite the church, TL 280 442. Cross the rec diagonally to a handgate, and walk SSE down the field boundary to a line of trees bordering the moat. Turn left alongside the tree belt, and cross a footbridge into “Tween Towns Wood”, a Woodland Trust reserve bordering part of the moat. Exit the same way, and find a handgate in the tree belt at TL 284 440. The path between fences crosses paddocks containing sheep, goats and sometimes alpacas. There is a good view of Morden Hall, especially in Winter. Emerge on Trap Road, and either turn right and walk back to the church, or make a longer walk using the huge number of signed paths in Guilden Morden. The Parish is notable for its medieval moated sites. Park in the village near “The Pig and Abbot” and explore. First visit the church (Norman origins, mostly C14th) and go past to the start of the brideway, to pass Manor Farmyard. The (partly) water-filled moat continues alongside the bridleway for some distance. Originally known as Abington Manor, the property passed from the Bishop of Winchester to the Pigotts family. Described in a late C13th widow’s dowry, it had a fish pond, 6 acre moated site, a walled and moated enclosure and outbuildings. In C14th, the Pigotts built a second house, reusing another moated site N of the church. The house was re-modelled in the C17th, and is romantically gabled. 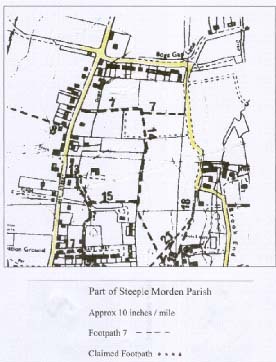 From the church, go along the bridleway and turn left at TL 306 449, and follow the track to Moynes Wood. Here, Moynes Manor once stood in a double sub-rectangular moat, still preserved (but not exciting!). By 1381, this was already described as an empty moated plot of 12.5 acres. Return directly to the pub (or make a 5 mile circuit via Flecks Lane, Running Ditch, past Shingay South Farm, and using the footpath starting NW of Boys Bridge). From the pub, go SW down to the road corner, TL 306 443, where take the footpath WSW to Bibles Grove. At the end of the trees, turn left (SE) to Down Hall Farm. This moated site comprises 2 adjoining moated enclosures. Many will already know the unusual timber-framed jettied gatehouse, at the entrance to the second enclosure, with timbers dating from 1250 to 1380. The existing farmhouse is C19th. (Do not go down the drive!). It is possible to continue a short distance to the signed former watermill (now a house), and to follow a footpath through the garden, giving access to a route to Litlington. The greater part of Kirtling village is owned by the Fairhaven Estate, said to have existed before the 1086 Domesday survey. To visit the towers and moat, park in the village hall carpark (if not in use), pass the village sign, and walk up Saxon Street. Pause to admire both churches. The church of Our Lady and St Phillip (RC) was built 1877. All Saints (C of E) contains the family vault of the North Family, first owners of Kirtling Towers. Take the footpath past All Saints generally E towards the Upend Road, giving good views of Kirtling Towers. In 1260 a Kirtling Castle was recorded. Later, within the castle’s platform, was built a brick Tudor house, bearing a date 1572. The occupied, turreted gatehouse is all that remains. A medieval moat, once the largest in the county, still surrounds the towers. Although some of it has been drained, the portions to the N & E of the building are still filled with a 60 – 70ft stretch of water. Return to the village sign and carpark. Other attractive routes in the vicinity include a circuit of Lucy Wood and beyond. In the middle of Fulbourn Fen Nature Reserve is a fine moated site, enclosing the former Dunmowes Manor Hall House. The moat was built in the medieval period. It is 30 ft wide, and up to 10 ft deep, and would originally been deeper, and full of water. There is no entrance, so access to the site must have been by means of a wooden bridge. The moat encloses about an acre, now grass and trees, with fallen tree-trunks, a good place for a picnic. A large stone and timber house stood on the E side of the platform, with further buildings to the N and W. Stone mouldings and fragments of painted window glass were found, suggesting a high status house. Whilst the moat may originally have been defensive, in later times, a moat became a status symbol. Soon after 1750, the house was abandoned in favour of another site on School Lane, Fulbourn. The site is easily accessible within the nature reserve, with an attractive display board. The main archaeological attraction in Rampton is Giant’s Hill, the site of a castle started in the mid-C12th, when the throne was contested by Royal cousins, Stephen and Matilda. Meanwhile, Geoffrey de Mandeville, a rogue Essex baron, captured the Isle of Ely and sacked the monks at Ramsey. Stephen ordered a ring of castles to contain the threat. Burwell, Swavesey, Caxton Moats, and Giants Hill survive as known castle sites. Geoffrey de Mandeville was mortally wounded at Burwell, so the castles were never completed. However, at Rampton there remains a splendid example of the unfinished fortification. The site’s rectangular platform is surrounded by a largely complete moat. The adjacent field shows grassy mounds of deserted house-sites. The castle site, owned by the County Council, is accessible from a gate in the village, off the main road at TL 430 680, or from the grass field next to the ancient thatched church. A display board gives points of interest. The moat, still water-filled, can be crossed on a board walk, and all parts of the site explored. Later additions include a WWII gun emplacement sited by the Home Guard. A moated manor was built by the Scales family and occupied by them in C13th to C15th. In the C16th, Sir Thomas Wendy, physician to Elizabeth I, bought the property. By 1726, the manor was described as “ruinous”, and in 1814 two wings were demolished. The E wing, moat and walled garden remain. The site overlooks the Well Field, a recreation meadow in the centre of Haslingfield, off a lane behind the church. The field boasts a well house, a period bakery, and a replica earth closet. Haslingfield’s present manor’s 3-sided garden moat survives in good condition at the rear of the meadow, fronted by trees and bushes. A brook issues from the moat, fed by internal springs. The moat is, however, rather difficult to see, except in the NW corner of the meadow, where a sign says “Danger, deep water”. Other points of interest in the locality are the unusual Millennium sundial, on the green, next to the village sign, which shows Elizabeth I on horseback, as when she visited Haslingfield in 1564. Only the chancel walls remain of the original Norman church, the later building having a notable C15th tower. The churchyard has a delightful short nature trail. Can anyone help the Parish Council and the Ramblers’ Association to claim a section of well-used path as a definitive right of way? The length of path is sign-posted by the County Council, who are now threatening to take the sign away! The path starts off Hay Street at TL 287 432, and runs to Brook End at TL 290 432. The section in question starts from a gap in the hedge, TL 288 432 and runs along field boundaries as a good grassy path to Brookside. Cantab usually appears about 4 times yearly. A large number of you now receive Cantab by e-mail. If you would like an issue by post, please send a large SAE. Offers of brief articles welcomed.. This is a privately produced magazine, and the views expressed are solely those of the editor, or of the author of an individual item. Cantab87 © Janet Moreton, 2016.